Strengthening its relationship with one of the most prominent RV manufacturers, Aqua-Hot is now standard equipment on Fleetwood RV's 2012 Providence model. Aqua-Hot is already available on the builder's American Heritage, American Eagle, American Tradition, American Allegiance and Revolution LE brand motor homes. "Aqua-Hot heating systems have been a proven performer in our Luxury Diesel American Coach brands for many years," said John Draheim, president and CEO of Fleetwood RV, Inc. "When our Fleetwood RV owners asked for a diesel heating system in our Providence 42' diesels, we knew that the Aqua-Hot 400-D heating system would exceed their expectations. We are committed to providing the best quality and comfort for our customers, and using Aqua-Hot is just one example of how we achieve this goal." 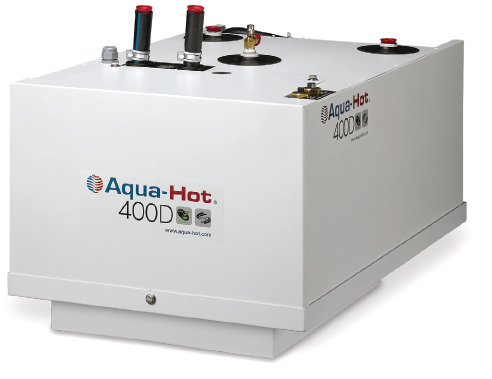 Aqua-Hot's new 400-D hydronic heating system can be mounted in the bay, while providing consistent heat throughout the RV. With five separate thermostatic heating zones and two circulation loops, the 400-D produces quiet, even heat throughout the living area by circulating hot water through up to eight Aqua-Hot Cozy Heat Exchangers. Contact Aqua-Hot Heating Systems, 15549 E Hwy 52, Fort Lupton, CO 80621. Toll free: 800-685-4298 or 303-659-8221; Fax: 303-857-9000. marketing@aqua-hot.com; www.aqua-hot.com.